Sunland RV Resorts is thrilled to take part in the 2013 Movember fundraising. Kicking off November 1, 2013, Sunland RV Resorts will be donating $1 for every mustached smile photo shared. RV Resorts is thrilled to take part in Movember 2013, joining the fundraising efforts for men’s health issues. Kicking off November 1, Sunland RV Resorts will be donating $1 for every mustached smile photo shared. Men, show your mustaches. Women and children, you can also help raise money for this great cause. Simply grab a prop mustache or draw a mustache or even Photoshop one on! 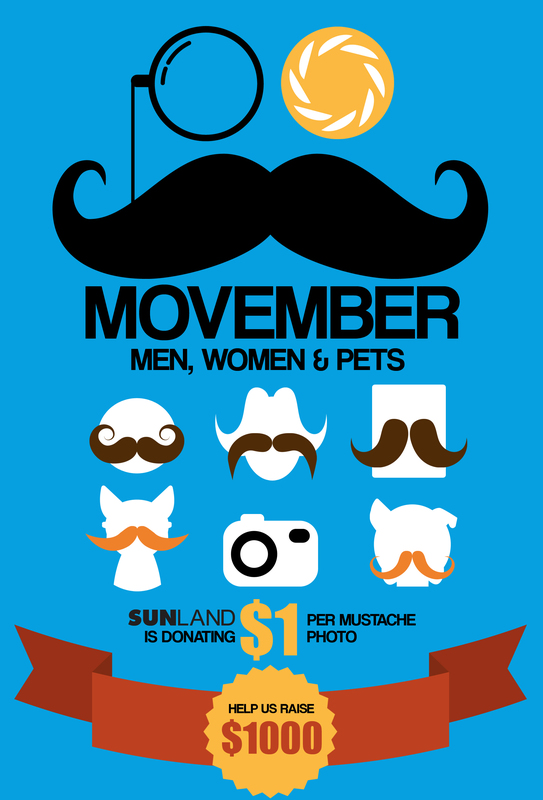 And, because we love our pets here at Sunland, we’ll even donate $1 to the Movember cause for mustache pet photos! Are you a current guest? Head into the resort office, grab a prop mustache and have our staff snap your pic! Or, snap a pic and share it with us using our Online Contact Form at the bottom of this page! Check back here regularly or find us on Facebook to see your mustached smile in support of men’s health causes! So what is Movember? With its roots in Australia, this month-long fundraising effort focuses on men’s health issues including testicular and prostate cancer, and mental health. To raise money “Mo Bros” start Nov. 1 clean shaven, then spend the next 29 days growing and maintaining awesome mustaches (or “mos” in Australian speak). Check www.movember.com for more.